American Banjo Camp is committed to offering highly specialized classes tailored to the expertise of our faculty. Over the course of ABC you’ll have the opportunity to take eight different classes and study with as many different instructors as you can squeeze into your schedule. Below you'll find information and links to more information about our classes, instructors, and camp schedule. 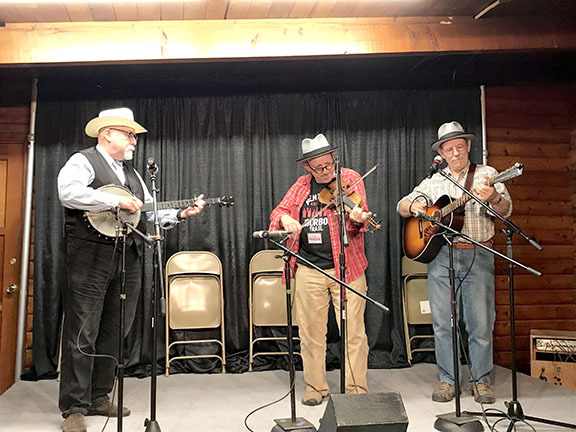 All classes at American Banjo Camp are “hands-on.” This means that students bring their instruments to class and receive active playing instruction under the watchful eye of a world-class instructor. ABC also offers "demos" (round-robin presentations given by our instructors on a variety of musical topics). Click here for more information about ABC classes. There are two faculty concerts at ABC – one Friday evening and one Saturday evening. About half the faculty performs each evening, so by the end of Camp you will have had a chance to hear our entire staff in concert. If you are a fan of bluegrass music, old-time music, or simply old-fashioned musical virtuosity and good taste, our concerts are simply not to be missed. From just about any vantage point, the music at our the ABC Faculty concerts is as good as anything you’d find at a bluegrass or old-time festival. In fact, students have told us repeatedly that the concerts alone are “worth the price of admission.” You can peruse lists of performances and purchase recordings made at past ABC concerts on the ABC Products page. ABC offers faculty-led ("hosted") jams at different levels and with topics designed to appeal to a variety of interests. There are both slow jams and jams at intermediate tempos in both the bluegrass and old time genres. Our specialty jam offerings are a little different each year. In 2016, for example, we scheduled vocal jams and a Pete-Seeger style “hootenanny.” To make all these jams even more satisfying, we often invite local professionals on fiddle, guitar, mandolin, and bass to come by and join us for an evening. Click here for more information on jams and lists of common jam tunes and songs. Note: Banjo students who play fiddle, guitar, mandolin, bass, dobro, or other compatible instruments are welcome to bring them along to our staff-led jams and join in! Following check-in and dinner on Thursday we have student orientation, followed by a student open-mic and band scramble, followed by faculty-led jams, followed by a light snack (for energy) and opportunities for more jamming. Classes start first thing Friday morning. There are three class sessions on Friday, four on Saturday and two on Sunday. In addition, we'll have faculty concerts on both Friday and Saturday nights, followed by faculty-led jams, a light snack (for energy), and opportunities for more jamming. You can learn more about the kinds of things we offer by checking the schedule.